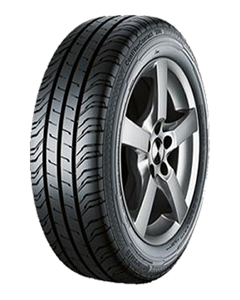 The new Continental Summer van tyre ContiVanContact 200. New rolling resistance optimized compound increases efficiency. Very good handling performance to ensure safety even under heavy load. The ContiVanContac 200 is a transporter specialist that has been designed for use in Western and Central Europe. With its sipes in the center of the tread and its grooves, it delivers safety even when driving and braking on rain-soaked roads. Its macro block profile and sturdy tread center deliver precise handling even under heavy loads on top of which the tyre also helps to save fuel thanks to a 15% reduction in rolling resistance (in comparison to the predecessor model). Straight away from the start of production, Continental will produce ten sizes that are suitable for rim diameters ranging from 15 to 16 inches and approved for speeds of up to 210 km/h. Safe journey thanks to shorter braking distances on wet roads. Safe handling in all situations, even under heavy loads. Considerably reduced rolling resistance for lower fuel consumption and greater efficiency. Trusted by leading car manufacturers; Renault Master, Renault Trafic and Mercedes-Benz Viano/Vito come fitted with ContiVanContact 200 from the factory. New aqua grooves in the shoulder and sipes in the centre of the pattern create a windscreen wiper effect through the sipe edges. The result: vastly improved water dispersion for safe wet braking. Thanks to the macro block tread pattern, there is improved contact with the road, and the pattern stabilisers increase the stability and rigidity of the tread pattern. The result: optimum driving performance.